The Bog Turtle (Glyptemys muhlenbergii) is North America’s smallest turtle (and one of the smallest globally). Unfortunately, the Bog Turtle is facing extinction and is listed as a federally-threatened species by the United States Fish & Wildlife Service. The Bog Turtle is also listed as threatened or endangered in every state where it occurs. Bog Turtles are generally found in two main allopatric (occurring in separate, non-overlapping geographic areas) populations separated by approximately 250 miles. Even within these main population centers Bog Turtle distribution is quite disjunct and occupied wetlands throughout the range can be many miles from the nearest known location. The northern allopatric population extends from Maryland northeast to western Massachusetts. Historically, disjunct Bog Turtle colonies were also found in the Northwestern Glaciated Plateau region of northwestern Pennsylvania, the Finger Lakes Region of New York, and the Lake George region of New York, but unfortunately the Bog Turtle is now extirpated (extinct) from these areas. The southern allopatric population generally follows the southern Blue Ridge Mountains, extending from extreme southwestern Virginia, southwest to northeastern Georgia, including portions of the and adjacent piedmont in North Carolina. Distribution in the south is also patchy, often with great distances between colonies. Bog Turtles are typically found in small wetlands or contiguous wetland complexes of early successional wetland habitats associated with the emergence of spring water and loose, mucky soils or tunnels. 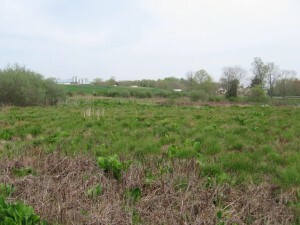 The spring-fed wetlands are usually dominated by emergent plant species such as: sedges, grasses, rushes, cattails, and mosses, with mixed patches of shrubs and trees. These emergent areas are necessary for Bog Turtles as they deposit their eggs in sedge and moss clumps that receive sunlight for most of the day. When shrubs and trees invade an emergent wetland the resulting canopy of leaves shade the sedges and mosses leaving the Bog Turtles without nesting areas. Bog Turtles often persist in rural and agricultural landscapes where livestock grazing plays an important role in maintaining the open, emergent wetlands that Bog Turtles inhabit. Prior to European colonization, these wetlands extended across dynamic landscapes that contained early successional habitats kept open by beavers, fire, and elk. Many areas where Bog Turtles exist no longer have these important habitat creators. Habitat succession problems are compounded by the real forces driving the Bog Turtles towards extinction – habitat destruction and fragmentation. Bog Turtle wetlands have been obliterated by development, ditched, poisoned, and surrounded by roads and houses for centuries. Only a tiny fraction of historical Bog Turtle wetlands (and wetlands in general) exist today. Additional threats include poaching and invasions of non-native plant species. Bog Turtles are highly coveted by illegal poachers and sold to collectors around the world. Why protect Bog Turtles? Bog Turtles are important for a multitude of reasons. Valid arguments for the preservation of Bog Turtles include the idea that all organisms have intrinsic value and have a right to exist. Many people find personal pleasure and enjoyment in seeing Bog Turtles and wetlands, and simply knowing that they exist. And numerous well-demonstrated reasons exist for preserving biodiversity. We believe that Bog Turtle protection is much bigger than an individual species, even as interesting and charismatic as these turtles are. Bog Turtles are a flagship species for wetland conservation and water quality, and are a part of our rural and agricultural heritage. Headwater wetlands fed by springs are essential for Bog Turtles. Wetlands have been demonstrated to be extremely important for functional landscapes and provide many beneficial services to humans. These particular spring-fed wetlands provide clean, highly oxygenated water into our landscapes, essential for all aquatic organisms. The streams and rivers that we utilize for drinking water and for recreation begin in headwater Bog Turtle wetlands. People from all walks of life, from the trout fisherman to those that simply prefer drinking clean water, should be Bog Turtle advocates. In the end, if we lose the Bog Turtle to extinction we will have also lost our rural heritage and jeopardized basic necessities like a cool, clean glass of water. Please help the Mid-Atlantic Center for Herpetology and Conservation and our partners protect the important species like the enigmatic and imperiled Bog Turtle. How does the Mid-Atlantic Center for Herpetology and Conservation help Bog Turtles? By conducting population studies. Prior to the first decade of the 21st century, most known Bog Turtle sites had very little data accompanying historical observations. While some of these wetlands may harbor small, declining colonies (or even be extirpated now), analysis of surveys from the 1980’s at known Bog Turtle sites revealed that many of these wetlands were simply under-sampled by inexperienced investigators. The Mid-Atlantic Center for Herpetology and Conservation with state and federal agencies are conducting population studies at historical Bog Turtle locations in Pennsylvania, New York, and Connecticut to determine the status and viability of these colonies. By facilitating the preservation of Bog Turtle habitats. The Mid-Atlantic Center for Herpetology and Conservation is aiding the Natural Resources Conservation Service and the U.S. Fish & Wildlife Service in the delivery of conservation easements to interested landowners. The Wetlands Reserve Program is the most powerful tool available for Bog Turtle landscape protection and has been incredibly successful in permanently protecting numerous Bog Turtle colonies throughout the Mid-Atlantic and Northeastern United States. The Mid-Atlantic Center for Herpetology and Conservation has partnered with numerous organizations and agencies to advance the knowledge and protection of the threatened Bog Turtle. Key partners are listed below. National Fish and Wildlife Foundation, National Park Service, Natural Resources Conservation Service/U.S. Department of Agriculture, Pennsylvania Fish & Boat Commission, National Park Service, U.S. Fish & Wildlife Service, Ecological Associates, LLC. Additional Key Partners: Natural Resources Conservation Service/U.S. Department of Agriculture, Connecticut Department of Energy and Environmental Protection, Massachusetts Division of Fisheries and Wildlife, New York State Department of Environmental Conservation, U.S. Fish & Wildlife Service.